Did you know that the government creates money out of thin air? The Federal Reserve Purchases Stuff. The last I looked, the Fed had somewhere around $2.5 trillion in assets. To make the purchase, the Federal Reserve writes a check. The guy selling–land, let’s say–for $1,000,000 takes his nice new check to his Bank. The Bank gets excited about a Federal Reserve check and, naturally deposits it in their own account which is held…AT THE FEDERAL RESERVE. 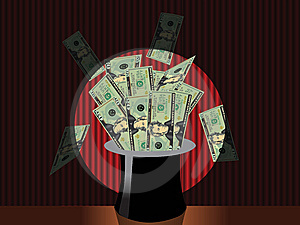 The hypothetical teller at the Federal Reserve goes “clickety click” on the keyboard, and–Presto Change-o–$1,000,000 is added to the account, and, therefore into the money supply. What does the Fed do with the stuff they purchase? Well, most of the assets the Fed actually buys are similar in form to (or are) bonds and debt. The assets are used as a way to support the paper money passed around and printed out, but only in a very stretched-out kind of way. One of the biggest purchases recently was the bank bailout–in which the Fed purchased illiquid assets–assets that can never be sold. All suffered here because of the devaluation of the dollar.